Next on The Scoop: Who’s That Cat? Meet the British Shorthair — Brits Rule! 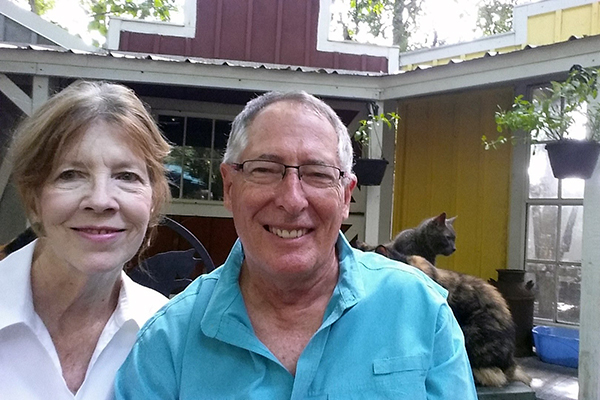 Bruce and Terry Jenkins fell into elder kitty care by accident; now it's their passion and purpose. Once upon a time, Bruce and Terry Jenkins were just an ordinary couple who loved animals. But one day, Terry’s sister told them about two older cats that were in dire need of a new home. One was 11 and the other was 12. 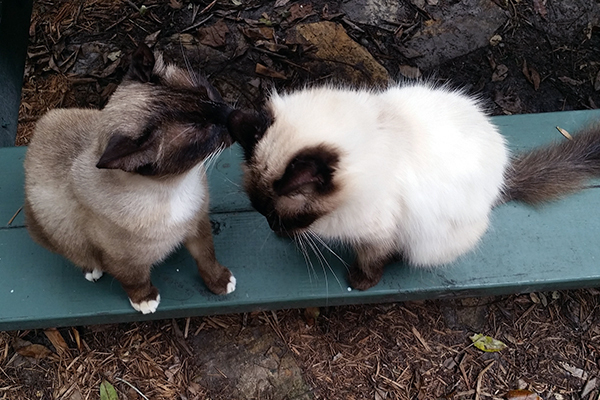 They’d been raised together since they were kittens, and they faced an uncertain fate if they were sent to a shelter. The Jenkins agreed to take the cats in. They were the oldest cats the couple had ever adopted. “During the process, we became aware of the fact that shelters considered cats over 10 to be too old for adoption,” says Bruce. Bruce and Terry Jenkins, with some of their Cats Cradle kitties in the background. This realization resulted in the birth of Cats Cradle Sanctuary and Hospice, a special place for senior cats to live out the remainder of their lives in comfort. Cats come to the facility through owners, veterinarians, and animal shelters with cats too old for adoption. 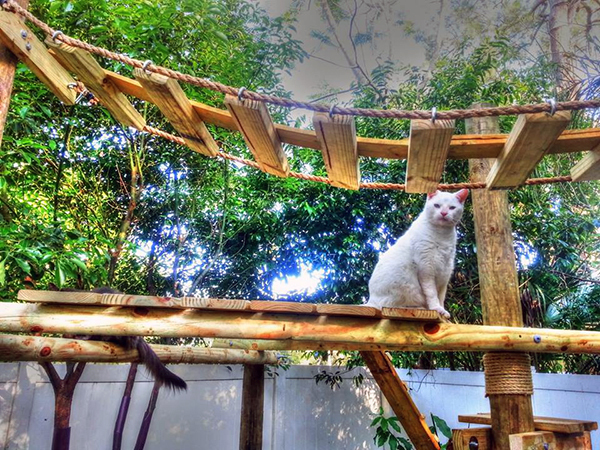 The beautiful facility, located in Florida, boasts fenced-in outdoor areas where the cats can enjoy warm, sunny weather safe from predators. The Jenkins built this area by rebuilding a “western town” that they had built for their children many years before. 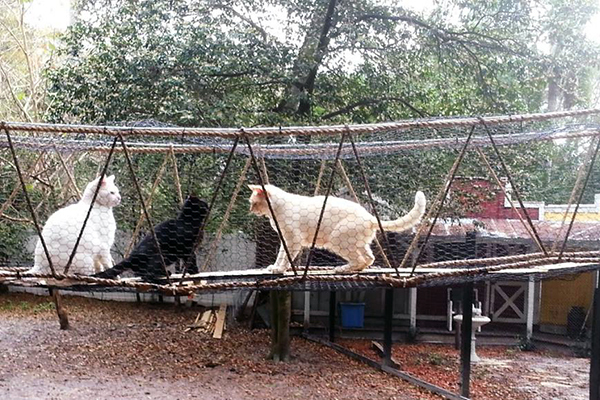 An exercise area, where cats can climb high and perch, is totally enclosed in netting. A bridge connects the exercise area to one of the buildings. “We have found that the older cats live happily in their community setting, with access to interior space as well as outdoor opportunities to climb bridges, watch fish and birds, and sit in the sun,” says Bruce. 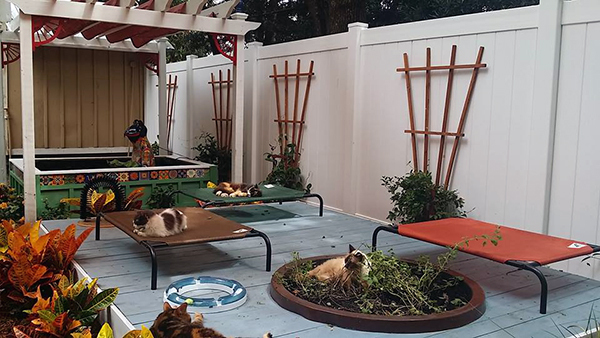 Cats Cradle also boasts a “tranquility garden,” complete with catnip plants and a fish pond for the feline residents to enjoy. Of course, there are also plenty of indoor areas where the cats can enjoy play, rest, and stimulation on rainy days. Babette rests on “Catnip Island” in the Tranquility Garden. “Our purpose is to provide a happy, healthy environment for old cats facing the crisis of no one to house or care for them in their old age — after years of loving care from their owners,” says Bruce. The residents also enjoy plenty of attention. “We have family and friends who enjoy giving our senior cats attention, and we spend time with them a minimum of twice a day, grooming, feeding, and cleaning up,” says Bruce. A Cats Cradle cat walks on a bridge in the sanctuary’s fenced in outdoor area. All the Cats Cradle kitties get full vet checks before arrival, and like any other shelter, the Jenkins keep complete veterinary records for every resident. “Most cats arrive overweight but otherwise healthy for their age,” Bruce says. 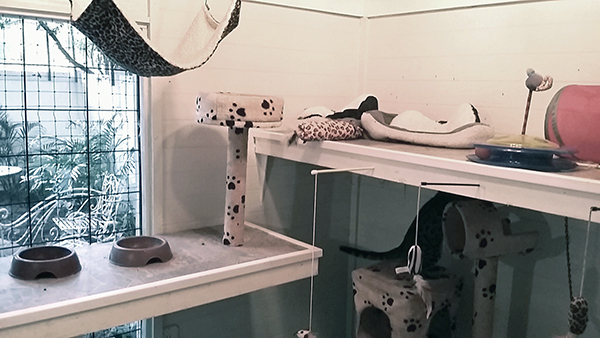 Although Cats Cradle has limited visitation, primarily to protect the elder cats because of their age and health concerns, owners surrendering their cats are welcome to visit the facility. One of the indoor areas at Cats Cradle. The couple subsidizes Cats Cradle mostly on their own. As a sanctuary and hospice, they don’t have an emphasis on placement, which is what many shelter-oriented grant programs look for. They do solicit donations through Cats Cradle’s website and through a GoFundMe campaign. They are also seeking a donation “angel” who will commit to the $400 per month needed to contract with a veterinarian to visit the facility each month and provide preventive and routine care. 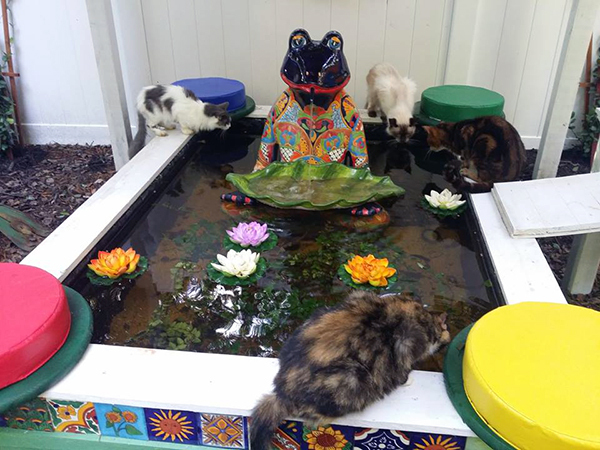 Cats enjoy the fish pond in the Tranquility Garden. 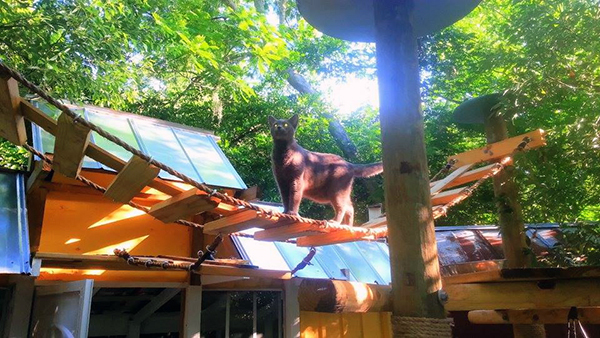 Thanks to one cat’s former guardian, Bruce and Terry were able to put new roofs on the buildings, and the Jenkins very much appreciate that donation to the cats’ comfort. One very important service Cats Cradle provides is a lifetime care program. People can arrange for Cats Cradle to take care of their cats in the event of their incapacity or death by making monthly or yearly donations that go to the organization’s endowment program. Bonnie and Clyde are best friends. People interested in the lifetime care program can also make bequests in their will or set up a life insurance policy payout to take care of the cost of their cat’s care at Cats Cradle. “Once you’ve enrolled your cat in a program at Cats Cradle, be sure to let your relatives, neighbors and friend know of your plan,” they advise, because it can take days or weeks for a will to be read and the cats may have been placed in another, less desirable situation in the intervening time. Although Bruce did the talking for this interview, he wants everyone to know that Terry is the heart of the organization, primary caretaker of the senior residents, and makes the final decisions on candidate acceptance. A group of cats enjoys breakfast on the patio. 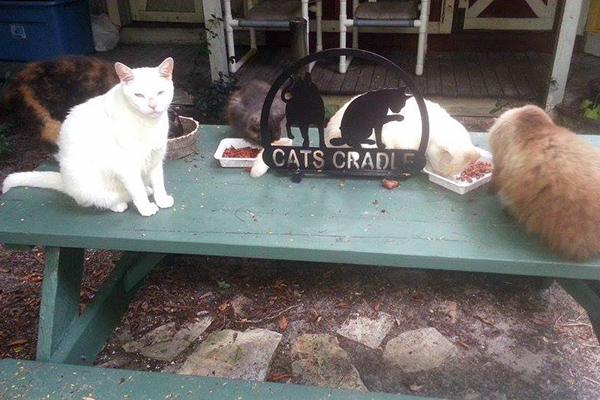 To learn more about Cats Cradle and the Jenkins’ vital work in saving senior cats from an uncertain fate, follow them on Facebook or visit their website. Photos courtesy of Bruce and Terry Jenkins; used by permission.